This week's circles. I think I'm going to start sewing these together as I go, probably by hand, so that might be a Sunday job. They seem very basic compared to others I've seen, but I am sticking with it. And Inner City has progressed a bit. It's not huge so it feels like it is going fast, especially when the last two I have quilted have been really big. Experience suggests, however, that in reality there are probably months of quilting this ahead of me. I love your denim projects, and this one is looking interesting. Maybe something to try for me? If all the 365 projects were the same, it would be boring! I really like your denim ones, they force you to appreciate the subtle differences in the fabrics. Looking good! Your circles look great! I think they look great all calm, and all the different shades of blue and the different size circles add a lot of interest. 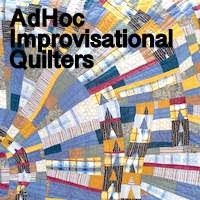 Great fabrics in this quilt - love the reds! Sweet seduction in those blues and blacks. Your denim circles remind me why we love that fabric so much - all those glorious blues. I'm plugging away on my circles but seem better at pairing fabrics than hand sewing. I think it can be really difficult not to compare what we're doing with what others are doing, for me anyway. I love the simplicity of your circles, the way they might appear all the same, but they're really not at all. Yours will be a very cohesive quilt. And please don't finish Inner City before Christmas 2015 - I feel inadequate enough as it is, haha!